What if you could escape your life with just one click? Bullied by his brother and living in the shadow of his athletic best friend, Jonah is crippled by self-loathing and insecurity. Then a mysterious stranger hands him a disposable camera with the power to transport him into someone else’s body—and someone else’s life. But with a limited number of shots and trouble mounting click by click, will this unhappy boy find a new life? Or will the secret he’s been keeping follow him wherever he goes? 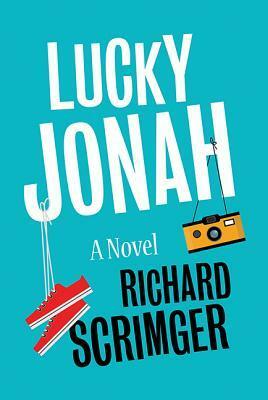 Richard Scrimger’s Lucky Jonah is a hilarious take on a Freaky Friday-esque switcheroo with a major identity crisis. At my school’s library, when I was looking for something interesting to read, the cover and synopsis of Lucky Jonah reeled me in. It sounded quite a bit like the premise of Every Day by David Levithan, a story I really, really adored. Just as I’d expected, I devoured it. Although it is technically a middle grade book, I was still able to find beauty in it that would benefit tweens, teens, and adults alike. For a quick summary, Lucky Jonah is about a boy in eighth grade named Jonah. He is quite insecure with himself, so when he gets his hands on a disposable camera, he finds that whenever he snaps a picture with it, he gets to turn into someone else for a short period of time. Will this help him leave his life that is full of insecurities? In spite of the lack of confidence that Jonah had, I still really liked him. I found him to be very strong and perceptive, and he always made the very best of each person’s shoes that he was in. I felt very sorry for him that he was bullied and ignored- he didn’t deserve it at all with his kindness and intelligence. Just like I did in the similar book Every Day, I also loved the premise of this one and thought that it was executed stunningly, once again. I think that I may just have a fetish for magical realism books- they are so fun to read, and I love still being able to delve into the contemporary genre and still read about magic without having to read a fantasy book, most of which I often dislike. Jonah’s journey in this book was super amusing to follow! There were also some pretty great morals in this story, if I do say so myself. Lucky Jonah teaches its readers to be proud of who they are, and that it’s totally okay to be different from everybody else. In this book, Jonah was questioning his sexuality, and in addition to the bullying, this left him very unsure and insecure with himself, but by the last page, he learned to be true to himself and to respect that he is who he is, and that he couldn’t change that. In conclusion, Lucky Jonah was a gorgeous novel. It’s also so underrated, and more people definitely need to learn about it, pick it up, and devour it! In my opinion, anyone over the age of twelve could benefit a ton from reading this touching book. Its protagonist is great, its plot is captivating, and its morals are perfection. Could you ask for a better book?